Beautiful scenery, fresh air, and exercise! 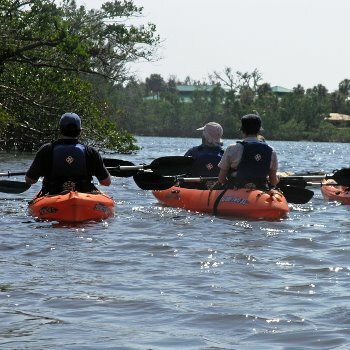 Join us for a kayak tour as we learn about the fascinating wildlife that calls the intracoastal home. Must have kayaking experience and be able to get in and out of a kayak without assistance. 1-2 people per double kayak. Ages 6-adult; children under 18 must sign-up and participate with an adult. Reservations required online at gumbolimbo.org or (561) 544-8615. Online reservations close 24 hours before the start of a program. Program are subject to cancellation if a minimum sign-up is not reached 24 hours before the start of the program. Program is subject to last minute cancellation due to inclement weather.